In October 2018, CCA Florida joined with the Building Conservation Trust, CCA’s national habitat program, and Shell Oil Company and deployed over 1,000 tons of concrete materials on the new Starship Reef off the coast of Jacksonville (30°10.177′ N / 81°09.351′ N)! These projects wouldn’t be possible without major partnerships and financial support – this project alone has a cost of almost $200,000. Thanks to Dames Point Workboats and Lambs Yacht Center for suppling the concrete reefing materials, the City of Jacksonville, and a huge shout out to Shell for their financial support and for donating 40,000 pounds of limestone rock which was hauled from San Diego to Jacksonville this past June in the new Starship truck. Shell’s new Starship truck is a hyper-aerodynamic, fuel-efficient class 8 concept truck, utilizing a variety of fuel-efficient technologies, all of which are available today, but are not yet in common use. These include advanced aerodynamic features, solar panels, an especially efficient Cummins 15-liter engine, low rolling resistance tires, and low friction lubricants from Shell within each driveline component. Its creation is the result of a partnership between Shell and Airflow Truck Company. The truck started its journey in San Diego, California on May 18, 2018. 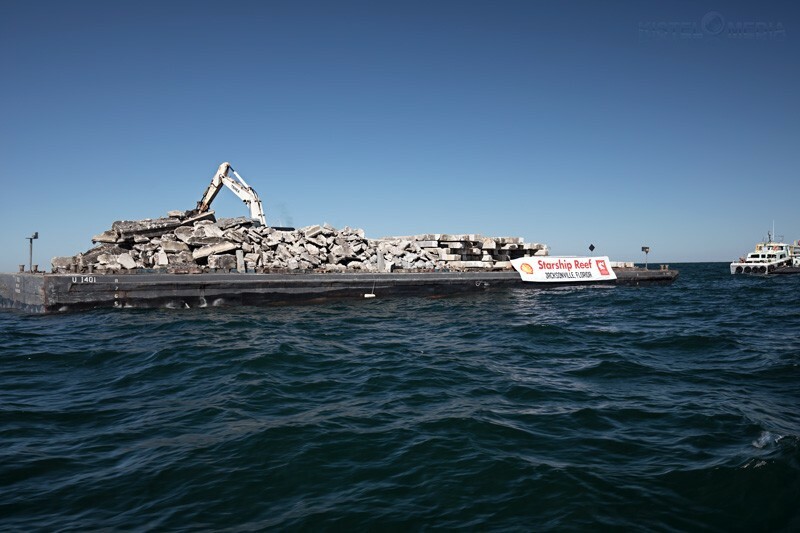 Transporting artificial reef materials to CCA Florida, Starship made pit stops in Gila Bend, Arizona; Comfort, Texas; Houston, Texas; and Biloxi, Mississippi. Starship finished its cross-country tour in Jacksonville on May 24, 2018. This new reef will create sustainable live-bottom habitat where none currently exists and will attract and sustain a wide range of fish, shrimp and crab species for decades. The Starship Reef will also provide an economic boost for this area in northeast Florida. Recent studies conservatively estimate that for every $1 spent on artificial reefs, the economic benefit of artificial reef expenditure returns was $138.